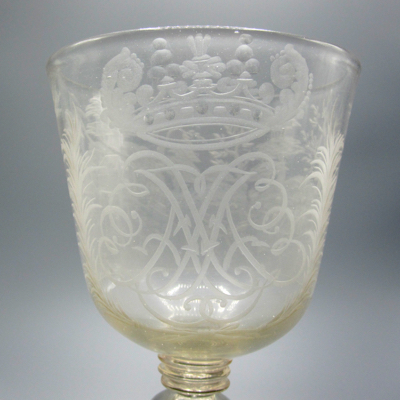 This superbly engraved blown wine glass was made in Nuremberg, Germany, c.1680-1700. It stands 10.5 inches high. 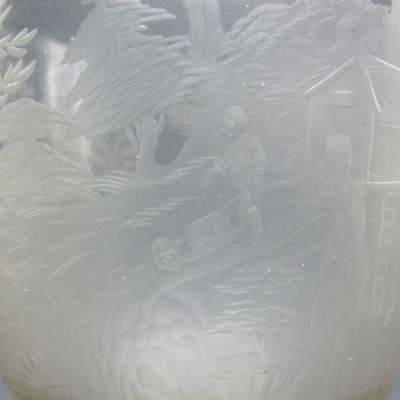 The large bowl features finely engraved scenes of open-pit mining and a large coat of arms, believed to belong to one of the Counts of Mansfeld. 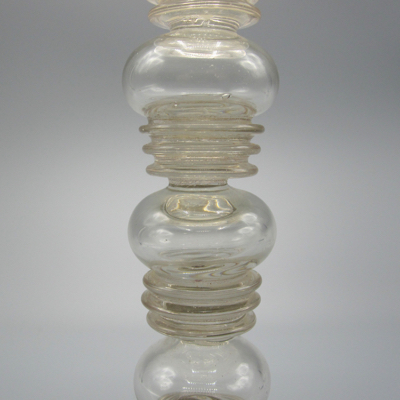 The delicate stem is made up of a series of hollow knobs and rings and amazingly, has remained intact after knocking around for over 330 years. The foot was not so lucky. 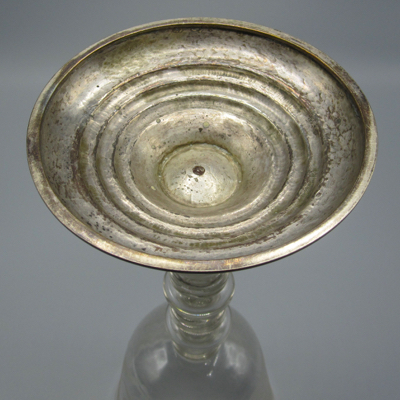 As would be expected of a large, fragile glass object such as this, the original glass foot broke off hundreds of years ago, and was fitted with an elegant hand hammered silver replacement. 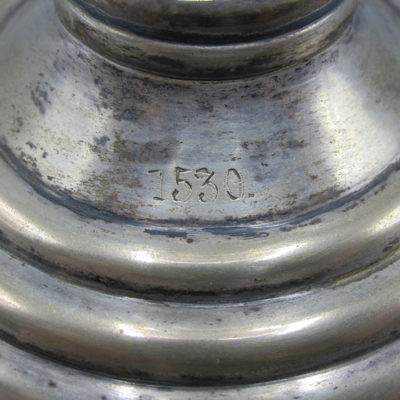 It is engraved with the name “Mansfeld”, the date “1530”, and in a tiny font “A.E. 12”. 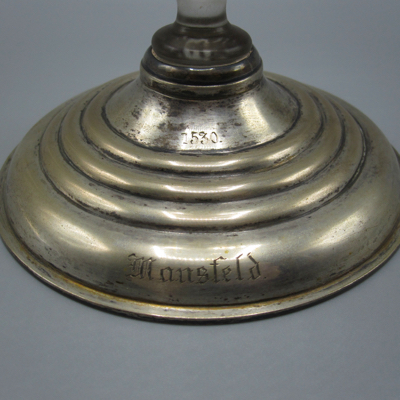 As Mansfeld, Germany was the center of silver mining for over 800 years, this magnificent goblet was most likely made by one of the Mansfeld families as a commemorative piece. As with almost everything from my collection, we will never know for sure how the piece broke, who repaired it, and what happened to it after it was reborn. I’m just glad that so many of them ended up in my collection and that I can share them with you. 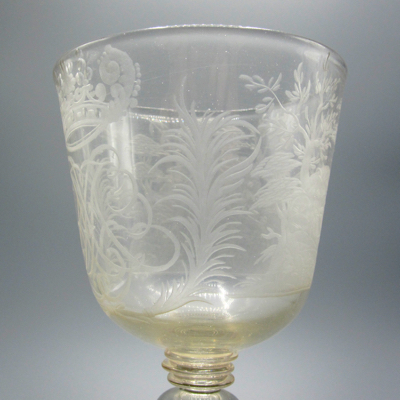 This goblet from the same period shows what the original glass base on mine might have looked like. 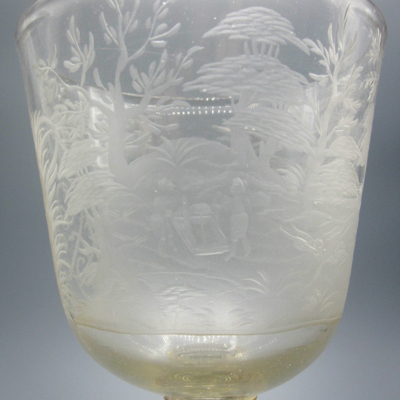 This entry was posted on Thursday, January 31st, 2019 at 3:39 pm and is filed under glass/goblet. You can follow any responses to this entry through the RSS 2.0 feed. You can leave a response, or trackback from your own site. 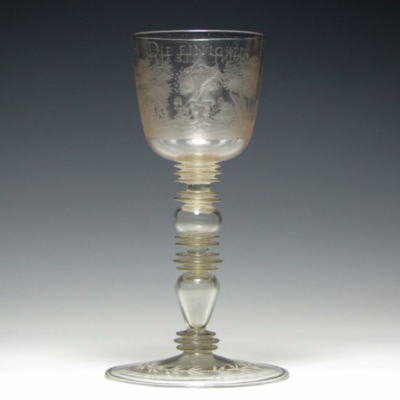 This goblet is magnificent on so many levels: it’s age, the artifact as document; the mining and silver production in Mansfeld history told in a pictorial way, craftsmanship, design (I love the stacked geometry of the stem), and it’s survival as a repaired piece. Thank you for sharing this. 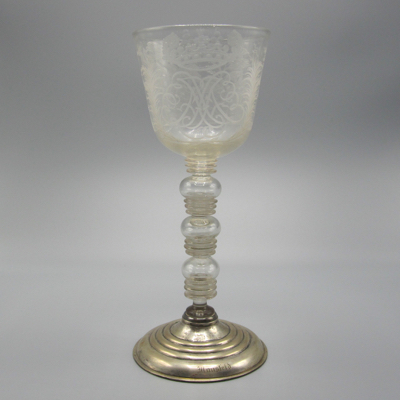 What a lovely solution for the foot of this goblet, and I love how the rings of the stem were echoed in the rings of the metal foot. 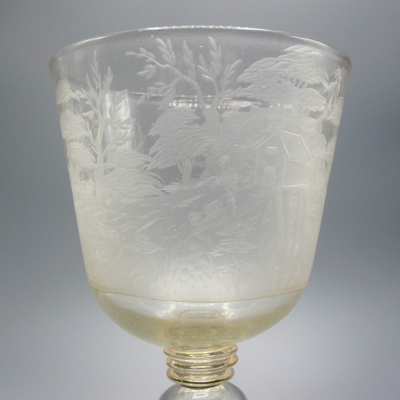 I recently unpacked some family glassware (Venetian mid-19th century) and found the most amazing repair on the stem of a champagne flute where the foot had snapped off; a beautiful brass collar with scalloped edges rejoins the two pieces. I love this one piece now far more than its 18 surviving sisters.